IFTTT and Amazon Echo support released !! Finally! IFTTT and Amazon Echo support released !! Re: IFTTT and Amazon Echo support released !! I had requested IFTTT support back in 2015 and I am very glad that D-Link has listened to suggestions like this. So thank you very much. 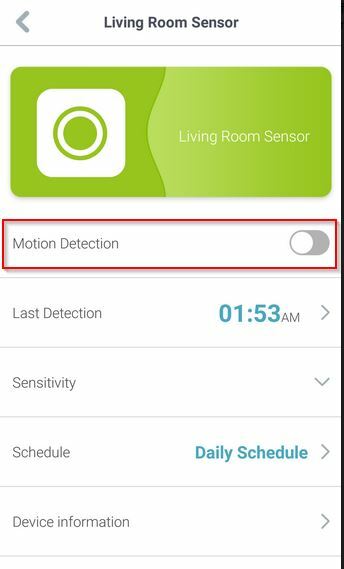 I'd really love this one extra feature with the Motion Sensor DCH-S150, while using with IFTTT. IFTTT is if THIS then THAT. There are many trigger services for THIS and many action services for THAT. Right now, the Motion Sensor DCH-S150, only offers a trigger service (THIS), which is "Motion detected", obviously. But I have thought of a use case for an action service (THAT) as well. This would be "Turn On or Off Motion Detection" upon a the execution of a trigger service (THIS). Find attached the screenshot for that functionality in the mydlink Home app. Here is my actual need. I use this sensor on a Schedule in conjunction with a smart plug (DSP-W110) for lamps. So lights on when motion is detected. Motion Detection is activated in the evening (6 PM) and deactivated at bedtime based on this schedule. However, in summer longer days causes early sensor-activation/lights-on while it is 6 PM (but Sunset is at 8 PM), and in winter shorter days causes delayed sensor-activation/lights-on at 6 PM (Sun already set at 5 PM). If the IFTTT feature I mentioned can be made available, then I can use a weather service for sunset at THIS and the Motion Detection On/Off at THAT. Then my problem will be solved, I will get the best results based on day to day sunset times automatically. Please try to pass this message to the appropriate people. It will really add major functionality to an already awesome device/suite. And development may be pretty simple as the IFTTT integration infrastructure is already in place. Same request as above, from IFTTT side/perspective. No actions. Please enable turning on/off motion sensing under Actions! We also need a "Motion stopped".. or "No motion after x seconds"
We can use dlink S150 to turn on a light.. but when motion stops, we have no way to trigger the light to turn off.